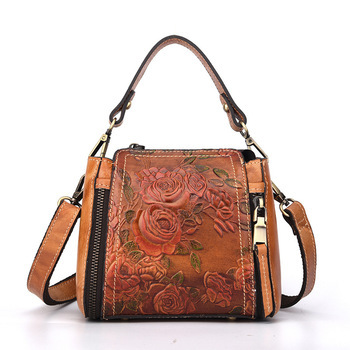 This beautiful Crocodile Pattern Luxury Leather Handbag shows your personal qualities while it reflects your glamour. This high-quality handbag is a symbol of elegant taste and individual style. It goes with everything. Naturally beautiful, this bag will make you feel like a queen! Professional artisans make our handbags with world-class genuine leather and high-class materials. The bag has five interior compartments which include one interior key chain holder, one interior compartment, one zipper pocket, one slot pocket, and one cell phone pocket. Women may use this stylishly designed bag for work, party, business, school, traveling, dating, or just simply shopping. Interior: Interior Key Chain Holder, Compartment, Zipper Pocket, Slot Pocket and, Cell Phone Pocket. Very good product (my wife happy I'm happy), Very fast shipment. recommended store. The Order was from China, the store to change the delivery from Russia. Goods received in Красноярском territory after 12 days of order. Shipping carrier. Thanks to the seller. description is fully compliant with excellent quality and bag. shipped in 6 days of payment.-прилагался nice gift bags to shawl.-this company all recommend manufacturer and supplier. The handbag is wonderful! Such as skin quality, pattern, craftsmanship! really super bag, comfortable, roomy, genuine кажа, very decent. shipping super speed, заказала 06,05, 18g, 09,05, 18г. already московскую delivered in area. молодец store. just молодец courier, all fast, clearly, separate thank you! all recommend.